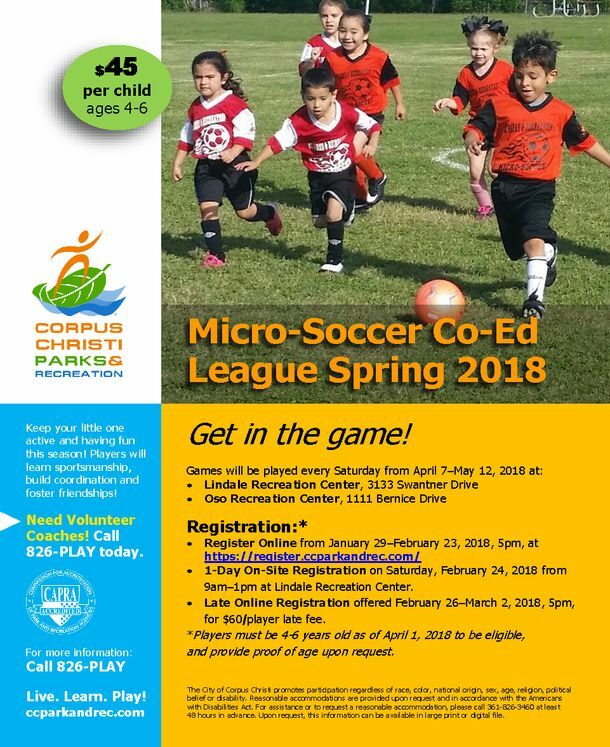 CORPUS CHRISTI, TX – The Corpus Christi Parks & Recreation Department is offering its Spring 2018 Micro-Soccer Co-Ed Youth League for ages 4-6 at Lindale Recreation Center at 3133 Swantner Drive and Oso Recreation Center at 1111 Bernice Drive. The field size is modified to accommodate these very young players with the focus on fun and the basic soccer concepts. Games will be played during a six-week season every Saturday from April 7–May 12, 2018. The cost to participate is $45 per player. REGISTER ONLINE now through Friday, February 23, 2018, by 5pm at https://register.ccparkandrec.com/. ON-SITE REGISTRATION will be held on Saturday, February 24, 2018 from 9am–1pm at Lindale Recreation Center. LATE ONLINE REGISTRATION will be accepted Monday, February 26 through Friday, March 2, 2018, by 5pm, for $60 per player. Applicants must provide proof of age upon request. Volunteer coaches are needed! Register online. For more information about the league or to volunteer, call (361) 826-PLAY. The Corpus Christi Parks & Recreation Department is dedicated to providing quality, affordable, enrichment programs for all ages and interests. For more information about the wide variety of programs and services offered by the department, visit www.ccparkandrec.com. We invite everyone to Live. Learn. Play!